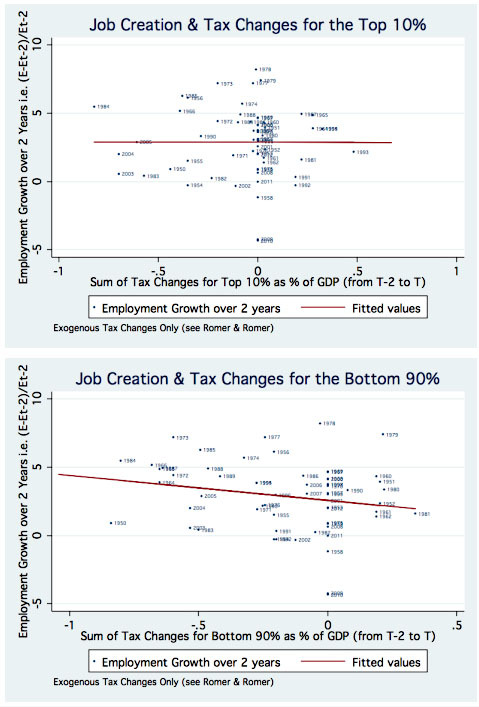 Figure 4 shows that there is not a relationship between tax changes for the top 10 percent and employment growth over a 2 year period. Overall, when considering all exogenous tax changes in the post-war period that went to the top 10 percent, the line that best ?ts the data is fairly ?at and insigni?cant. Figure 5, however, shows a substantially stronger relationship for the bottom 90 percent….Since tax changes for the top 10 percent are often correlated with tax changes for the bottom 90 percent , the apparent slight relationship between tax changes for the top 10 percent and output growth seems to result from tax changes for the bottom 90 that have a stimulative e?ect and occur at the same time. The two charts below show Zidar’s results, and they’re of more than just academic interest. If Barack Obama wins reelection, he’ll have far more leverage to raise taxes on the rich than he’s had before, because he can simply let the Bush tax cuts expire completely and then go back to Congress in January and propose new tax cuts that include only the middle class. Republicans can refuse to pass them, but that’s a huge political loser since Obama will almost certainly be able to portray this as holding middle class tax cuts hostage to tax cuts for the GOP’s rich pals. That leaves only the usual tired top-marginal-rate-trickle-down economic argument, and Zidar’s results suggest that Obama doesn’t need to worry about that either. Eliminating the Bush tax cuts on the rich probably won’t affect job growth much at all.